Cylinder body made of steel, phosphatized. Remaining parts made of tempering steel. Valve seat and piston are hardened and ground. This valve is leak free. The stop valve shuts the flow from P to A when the pressure set A is reached. It opens when the pressure at A falls below the set value (e.g. through leakage). 1. Single-circuit system: The pressure reducing valve is used in a hydraulic circuit, where part of the cylinders are only to receive a reduced pressure (e.g. 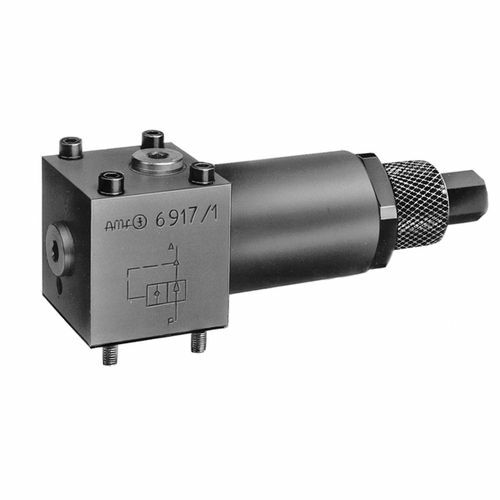 to prevent distortion of the workpieces or for positioning). 2. Dual-circuit system: If two working circuits are to be operated with different pressures from a single pump unit, the pressure of one circuit must be reduced by inserting a pressure reducing valve.